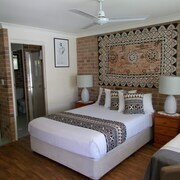 Beds needed extra blankets/ doona as very cool night and not warm enough. Mattresses comfortable. Hosts as always courteous and accomodating. Suggest extra blankets available in room for cool weather. 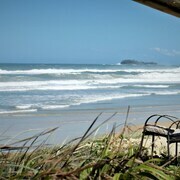 Nestled on the beach, this Marcoola hotel is within a 5-minute walk of Marcoola Beach and Mudjimba Beach. Twin Waters Golf Club is 2.7 mi (4.3 km) away. really lovely stay. The facilities were super clean and the rooms were lovely and airy. I would highly recommend! 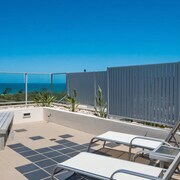 Nestled on the beach, this Marcoola apartment building is just steps from Marcoola Beach and Mudjimba Beach. Twin Waters Golf Club is 2.5 mi (4 km) away. Winter Break We loved Sand Dunes. The apartment was clean and spacious. The spa was fantastic. The heated pool was lovely too. A definite must in the winter as the lagoon pool was freezing. Location was close to walks and waterfalls. Excellent we were made very welcome. Gardens r beautiful and we'll kept. It was nice and clean and the water was hot. No airport noise that we expected. Manager seemed a bit stressed. Pool was great, showers were awesome. A number of the lamps didn’t work and the tv didn’t work initially. Quiet little part of town close to everything Thank you we had a great time. Room was super clean and we enjoyed our stay. Just like that second glass of champers, travel fixes everything. 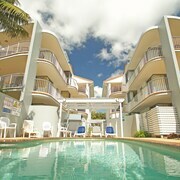 So forget your worries and book a hotel in Marcoola Beach, 19 kilometres from central Sunshine Coast! Take a leap of faith and float on the air like a bird at Skydive Ramblers. If you'd like to crash someplace nearby, two awesome options are the Sand Dunes Resort and Magnolia Lane Apartments. For an afternoon out under the sun, play a round at Mt Coolum Golf Club. 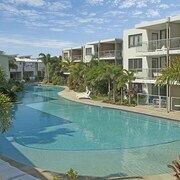 The Point Coolum Beach and Surf Club Apartments are among the most sought-after hotels to inquire about near here. If you get home and you're not slightly scared to check your bank balance, did you even go on a holiday? 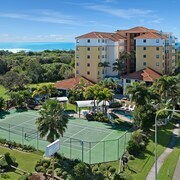 The Atlantis Marcoola and San Marino By The Sea Apartments are worth looking at if you're into spending a few extra notes. Why not get your mates together and plan the first night of your holiday over a hot coffee at CUBA ST. Marcoola? It's pretty close by, and there's plenty of sweet treats to keep your energy levels up. Trust us, you're gonna need something substantial to chow down on after all that sightseeing. Luckily, SumoSalad has a tasty menu which will really put a lining on your tum! 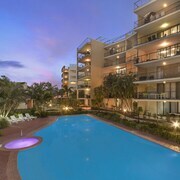 If all that grub has left you thirsty, Surfair Beach Hotel is just a stone's throw away. It's a great place to pull up a stool and get to know the locals! Don't pull your hair out if you can't snag the ideal Marcoola Beach hotel room. You'll find more places to get a great night's sleep nearby. 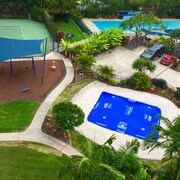 Sunshine Coast Airport is around 2 kilometres from Marcoola Beach, and Pacific Paradise is 3 kilometres away. Not much is better than stepping off the plane into a new, wild and unknown place. Hotels, flights, experiences, rental cars — you name it, we can make it happen!